One of the earliest buildings in Bel Air. 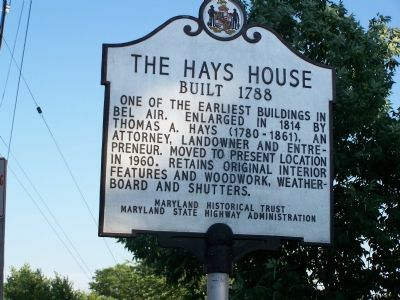 Enlarged in 1814 by Thomas A. Hays (1780–1861), an attorney, landowner and entrepreneur. Moved to present location in 1960. Retains original interior features and woodwork, weatherboard and shutters. Erected by Maryland Historical Trust and the Maryland State Highway Administration. Location. 39° 31.947′ N, 76° 20.824′ W. Marker is in Bel Air, Maryland, in Harford County. Marker is on Kenmore Avenue (Maryland Route 924), on the right when traveling east. Touch for map. Marker is at or near this postal address: 324 Kenmore Ave., Bel Air MD 21014, United States of America. Touch for directions. Historic Bel Air (approx. half a mile away); In Grateful Recognition (approx. 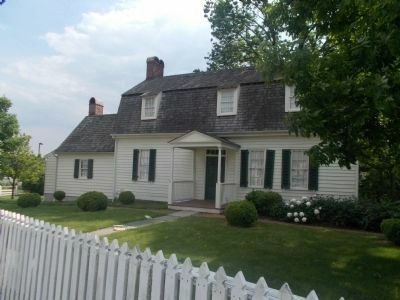 half a mile away); Built 1898 Liriodendron (approx. half a mile away). Touch for a list and map of all markers in Bel Air. Regarding The Hays House. 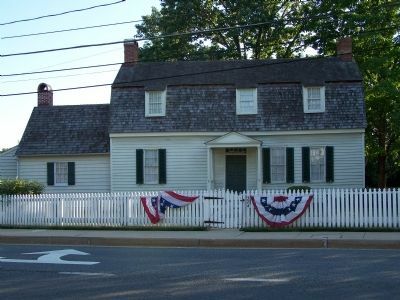 Building is the museum of the Harford County Historical Society and is open Sundays 1pm to 4pm. More. Search the internet for The Hays House. Credits. This page was last revised on March 15, 2019. This page originally submitted on June 21, 2007, by Bill Pfingsten of Bel Air, Maryland. This page has been viewed 2,027 times since then and 11 times this year. Last updated on March 8, 2019, by Steven Varner of Escondido, California. Photos: 1, 2. submitted on June 21, 2007, by Bill Pfingsten of Bel Air, Maryland. 3. submitted on May 13, 2012, by Syd Whittle of El Dorado Hills, California.